Ryde Lawn Tennis & Croquet Club provides excellent year-round facilities for all levels of tennis and croquet. There are eight tennis courts, six of which are astroturf and two are grass. Croquet is played on four full sized lawns from April to November and, in the winter, the two grass tennis courts are set out for croquet. Open & Club tournaments are run for both tennis and croquet, and teams are entered in a number of leagues, thus providing sporting opportunities for all ages & abilities. Our clubhouse has recently been extended and modernised with a new members’ bar and kitchen enabling the clubhouse to be used throughout the year for chess, bridge and other social activities to take place. The club also has its own car park. 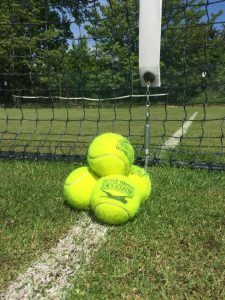 Ryde Lawn Tennis & Croquet Club is run on a voluntary basis, by the members for the members, so all are expected to help in whatever way they can. Non-members are welcome to use the facilities, subject to availability, on payment of the appropriate non-member fees. Ryde Lawn Tennis and Croquet club provides excellent all year-round facilities for all levels of tennis. The club has six well maintained astro turf courts, recently rejuvenated and two grass courts for use in the summer months. Five of the astro turf courts are floodlit. Members can play up until 10.00pm every day. The club owns an automatic ball machine and a practice wall is also available for members’ use. The Club has four full sized croquet lawns maintained to a high standard with the help of a lot of volunteer labour. Between April and October, there are three Club “Mix-ins”for Golf croquet on Tuesday, Thursday and Saturday from 2 p.m. which include a break for afternoon tea. 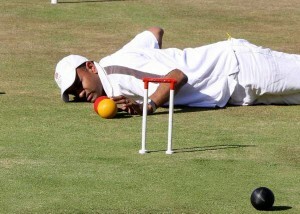 Association Croquet “Mix-ins” are held Monday from 2 p.m. and Wednesday afternoon from 4 p.m. The recently renovated and extended clubhouse with its new, modern bar and kitchen, big-screen TV and sound system provides excellent year-round facilities for socialising. So as well as the outdoor tennis courts, croquet lawns and pétanque piste there is also a healthy calendar of indoor social activities with an active choir, bridge and chess groups, pilates sessions, quiz nights, dance nights, fancy dress parties and more! We are a non profit-making organization, with all subscriptions and income used for the running and maintenance of the Club. Wherever possible we donate our own time and skills to keep our subscription rates as low as possible.